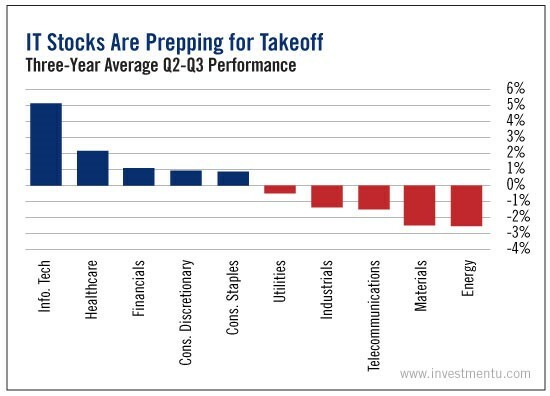 What’s the best sector to be in over the next six months? So far this year, technology stocks have delivered some impressive gains. As tracked by the S&P 500 Information Technology Index, they’re up 12%. That’s nearly double the broad market’s 6.4% return, as tracked by the S&P 500. Over the second and third quarters of 2014 through 2016, the technology sector delivered an average return that has crushed every other sector in the market. It outperformed the healthcare sector by 135%... the financial sector by 367%... and consumer staples by 512%. And during the same period, utilities, industrials, telecom, materials and energy stocks all had average returns in the red. But will this market-beating trend continue for tech stocks? While past performance cannot guarantee future results, the cards are undoubtedly stacked in the sector’s favor. Fact is... the tech space is red hot. And one of the major drivers behind this boom is the Internet of Things (IoT). If you’re a regular reader, you’re no stranger to the IoT. Its defining theme is connectivity - one of Matthew Carr’s three Cs of technology investing (which he wrote about most recently here). The IoT trend reflects a huge effort by tech companies to connect almost anything and everything to the internet through the cloud. Smartphones, home appliances, automobiles... you name it. Soon, virtually every household object will be connected with others across the globe through the internet. But if you can set your fears of a robot overthrow aside, you might see the massive profit opportunity that’s right in front of us. Two ETFs you should definitely keep in mind are the PowerShares S&P Small Cap Information Technology ETF (Nasdaq: PSCT) and the Global X Internet of Things Thematic ETF (Nasdaq: SNSR). The PowerShares ETF tracks the IT sector broadly, but the Global X ETF will give you targeted exposure to the IoT boom. Some of its top holdings include Skyworks Solutions Inc. (Nasdaq: SWKS), up 31.8% this year... STMicroelectronics N.V. (NYSE: STM), up 37.4%... and Mobileye N.V. (NYSE: MBLY), up 56.5%, which was recently acquired by Intel. If history is any indication, these tech plays could offer big gains over the next six months... and for years to come.